Examples of physical connections between objects with discordant redshifts are not limited to the optical portion of the electromagnetic spectrum. There are many examples of connections that are detectable in other wavelengths such as radio waves and x-rays. Seemingly vast bridges of material have even been detected in the highly energetic gamma ray end of the spectrum. 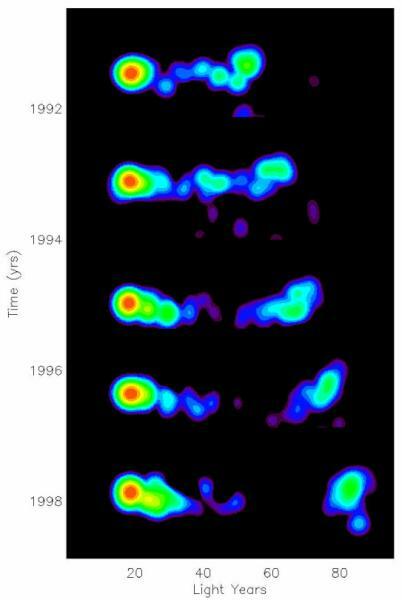 One such connection was detected by the Energetic Gamma Ray Experiment Telescope (EGRET) onboard the Compton Gamma Ray Observatory operated by NASA in Earth orbit from 1991 to 2000. The highly energized bridge of material observed by the telescope encompasses and appears to connect a group of quasars with very varied redshifts. The two most well known and active members of this group are the quasars 3C 273 and 3C 279 of the Third Cambridge Catalog of Radio Sources. Dr. Halton Arp describes this discordant pair of objects in detail in his book Seeing Red: Redshifts, Cosmology and Academic Science (Apeiron, 1998) and includes a hand reproduced figure of isophote contour lines generated from EGRET observations. An isophote is a line on a diagram or image of a celestial object joining points of equal brightness. I was able to recreate these contour lines in even more detail using the free Aladin interactive sky atlas software developed by the Centre de Données astronomiques de Strasbourg. 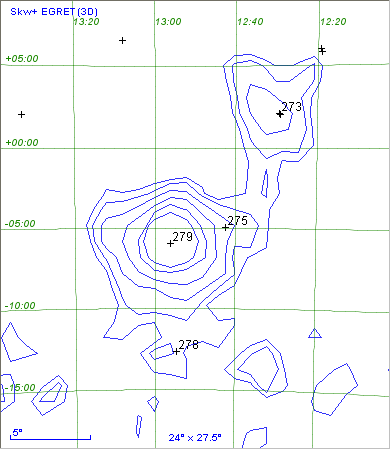 The image on the left is a direct export from this software and includes the contour lines from the EGRET observations overlaid with numbered object markers from the Cambridge Catalog. In this image it can be clearly seen that a bridge of material emitting gamma rays envelopes and connects the quasars 3C 273 and 3C 279 and even continues south to end almost directly on 3C 278. The quasar 3C 275 also appears almost directly aligned within the bridge’s path between 3C 279 and 273. One would think that such an obvious connection between objects as displayed here would be widely accepted by modern astronomers and astrophysicists. Unfortunately that is not at all the case and these observations stirred up quite a controversy within the scientific community when they were released. To understand the source of this controversy we must of course first begin with the redshift measurements of these four objects. Quasar 3C 279 is one of the brightest gamma ray objects in the sky. And with a redshift of .536 z as listed in NED it is assumed to be quite distant at almost 6.9 billion light-years away using a so-called Hubble Constant value of 55 (km/s)/Mpc. However, accepting such a distance would make this object one of the most energetic and powerful radiation emitters in the known Universe by many orders of magnitude. 3C 273 is the first celestial object ever identified as a quasar. It is also assumed to be one of the closest to Earth with a redshift of .158 z which supposedly places it at a distance of 2.5 billion light-years when using the same Hubble Constant. 3C 273 is the brightest quasar in the night sky with an apparent magnitude of 12.9 which makes it visible to even amateur astronomers’ telescopes. At its accepted distance this brightness equates to an absolute magnitude of 26.7 which also makes this quasar one of the most luminous in the known Universe. The radio source 3C 278 is associated with the galaxy NGC 4782 and its companion NGC 4783. NGC 4782 is the host of 3C 278 and has a redshift of .013 z which gives it an assumed distance of 234 million light-years. NGC 4783 is the northern galaxy in most images of the pair and has a redshift of .154 z which would place it 270 million light-years distant. However both objects are themselves connected by a bridge of material and appear less than 40 arcseconds apart. Quasar 3C 275 has a large redshift of .480 z which presumably puts it at a distance of 6.3 billion light-years away. Again, as with all the aforementioned 3C radio sources, distances were calculated using a Hubble’s “Constant” of 55 (km/s)/Mpc. How can such widely separated objects be bridged with such a highly energetic field of material on such an enormous scale? According to their accepted distances 3C 279 and 273 alone are roughly 1 billion light-years apart in the sky and over 4 1/2 billion light-years apart in distance from Earth. There are over 6 billion light-years separating the closest objects from the furthest objects in this group. There is no real conceivable way such a body of mass and energy could exist in the Universe unless it was actually much closer to us than had previously been assumed. Greatly reducing the actual distances to these bright radio sources also resolves a very surprising discovery made when observing the cores of the two brightest objects, 3C 279 and 273 using the Very Long Baseline Array (VLBA) and other radio telescopes. Jets of material have long been observed being ejected from the cores of these two quasars. But prolonged observation and analysis using radio telescopes have revealed that these jets appear to be ejecting material at several times the speed of light! The image to the right was provided courtesy of the National Radio Astronomy Observatory / Associated Universities, Inc. (NRAO/AUI) which operates the VLBA and other radio telescopes. It is a time-lapsed mosaic of 3C 279 and a stream of material that has been ejected from its core. As indicated by the markings along the axis the bright blob of material at the end of the stream traveled roughly 25 light-years over a period of only 7 years. This would place the velocity of the stream at approximately 3.6 times the speed of light! There have even been jets of material observed in 3C 273 that appear to be traveling at almost ten times the speed of light! How can this be possible when the speed of light cannot be broken? The latest and most accepted explanation proffered by scientists is that these superluminal velocities are merely optical illusions. These illusions are supposedly generated by relativistic effects caused by the jets traveling very close to the speed of light and at very small angles to the line-of-sight of the observer. However, the length and collimated nature of the jets preclude the possibility that we just happen to be observing both quasars with their jets pointed almost directly at us. Therefore relativistic effects, if they even do exist, would not be the cause of these observations. This leaves only two other possibilities. Either the laws of physics have been broken and the speed of light has been exceeded by several-fold, or the quasars simply aren’t as far away as most astronomers believe them to be. The latter possibility is at least testable using simple mathematics. For example, if 3C 279 was actually located less than 2 billion light-years from Earth, instead of the almost 7 billion as generally believed, the superluminal velocities of its jet would be reduced to subluminal speeds due to reduction in scale. Similarly, reducing the distances for all of the aforementioned quasars greatly reduces the overall expected scale of the surrounding gamma ray bridge and required power output of the encompassed quasars. But changing the accepted distances calls into question the accuracy of distance measurements based on redshifts believed to be caused by universal expansion. And of course calling universal expansion into question calls the Big Bang Theory into question, and thus the controversy. Discordant redshifts breed discord by providing all of us an opportunity to question long established scientific theories that may be based on incorrect assumptions. Do you have questions or comments about this example or do you have an example you would like to contribute? Your input is not only welcomed, it is encouraged.